Michel Hazanavicius's acclaimed 2011 silent film is getting the Blu-ray treatment in April. 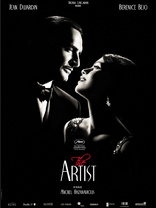 In an early announcement to retailers, Sony says 'The Artist' will have a Blu-ray release on April 24. The film won the Best Actor Award at Cannes, the BAFTA for Best Film of the Year, and has 10 Academy Award nominations including Best Original Screenplay, Best Director, and Best Picture. Specs have yet to be detailed, but supplements will include: The Artist: The Making Of A Hollywood Love Story, Hollywood As A Character: The Locations of The Artist, Q&A with the filmmakers and cast, and Blooper reel. You can find the latest specs for 'The Artist' linked from our Blu-ray Release Schedule, where it's indexed under April 24.